So if you ever want to invade a tiny Pacific island nation or the cabin across the lake, here’s the perfect vehicle for the job. Actually no, that’s a terrible idea. The Sealander is basically a floating box with wheels that hardly possesses a credible means for propulsion. 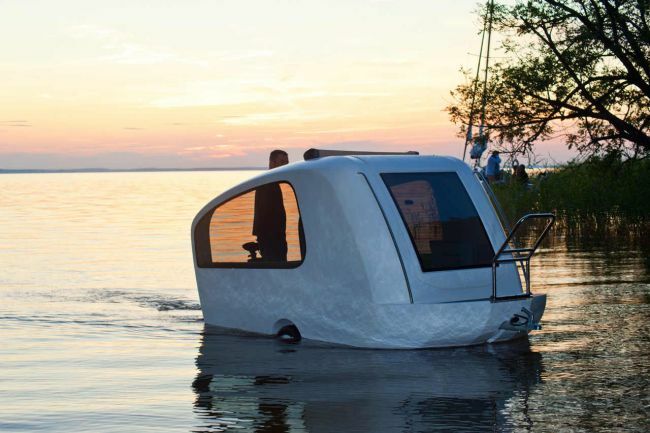 Perfect for lazy floats on the surface of placid bodies of water, the Sealander is a vacationer’s dream. Funny, it’s called Sealander but works best in peaceful lakes with very weak to nonexistent tidal action. The accompanying promotional literature for the amphibious Sealander claims it has a low-emission propulsion engine. Judging by the pic above, it doesn’t really do much except keep it slightly mobile on the surface. Bringing a paddle along might be a good idea. The attractions of the Sealander, however, are noteworthy. The roof can be opened, the interior modified, and it’s so lightweight even horses can pull it. How about that? An amphibious chariot? The Sealander will start selling next year for a hefty $20,000. Bit of a downer, that. As for taking the Sealander whitewater rafting? Forget it.